The UN Human Rights Council adopted today a resolution renewing the mandate of the UN Special Rapporteur on human rights in Iran. A majority of 21 states voted in favor of an extension of the mandate, which was opposed by only 7 member states, while 19 states abstained. The adoption of this resolution, introduced by Sweden, allows the extension of the mandate of the UN rapporteur on Iran for one more year. Following the tragic passing of Ms. Asma Jahangir, who was Special Rapporteur on Iran since 2016, a new mandate holder will be appointed by the Human Rights Council in June this year. Most notably, the resolution was supported by a large number of Latin American, Asian and African member states, representing almost half of the supporters of the resolution, including Côte d’Ivoire for the first time, as well as Chile, Mexico and Peru. While Brazil abstained on the resolution, the country made a statement where it stressed areas of remaining concerns, including death penalty, the rights of women, children and religious and ethnic minorities, including the Baha’is. Before the vote, Mexico also stressed its concerns on these issues, as well as about freedom of speech and assembly. 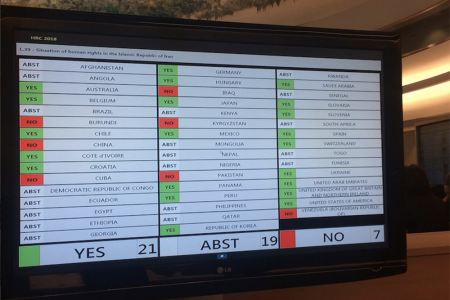 Senegal and Rwanda who had supported the mandate in the past regrettably decided to abstain today, and while Georgia confirmed a position of abstention at odd with their proclaimed positions of championing human rights and international monitoring. However, one of the most notable lessons of this vote has been the relative collapse in the votes of opposition to the mandate. After 12 states opposed the resolution last year, only 7 states voted against the resolution today, a historical low since 2014. Earlier last week, an unprecedented number of 46 Iranian and international NGOs called on member states of the Human Rights Council to support the Swedish resolution on human rights in Iran, in order to “allow the continuation of a mandate that has proved vital for the advancement of human rights in Iran and yielded important gains”. This vote ends a session of the Human Rights Council that had started four weeks ago by an incident created by the Iranian government’s decision to select Minister of Justice Seyyed Alireza Avaei, a major human rights violator placed by the European Union and Switzerland on their respective lists of individuals banned from travel and for accessing their assets because of their involvement in gross and systematic violations of human rights in Iran.